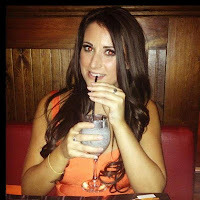 When i go to TGI's my favourite cocktail to get is the Barnamint Baileys. It reminds me of an adult mint choc chip ice cream type drink and its incredible yummy! It doesn't taste like alcohol which is a bonus. 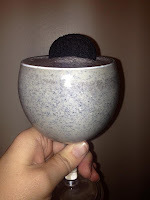 It has a mixture of ice cream, Creme De Menthe, Oreo biscuits, ice and of course Baileys. I have tried numerous times to make this cocktail at home and i have finally got it correct. Pour all of the above into a blender. Be careful with the ice because it tends to fly out if you are using a hand blender. Once it is all blended, it should be of a thick consistency - think ice creamy! Pour into a glass, and top it off with 1 Oreo cookie.